The LBE catalogue section is divided into years based on the date of issue. There is an index page linked to keywords for each LBE. The Little Brown envelope is the primary means of making rare stamps, such as limited editions and sport, available to the collectors. The original price of the package was £4.99 but it has now increased to £5.00. The LBE is basically a brown wage packet measuring 102mm wide by 109mm high with a 30mm flap. As can be seen the LBE is not square. In all but three cases, the Discworld Cinderella LBE, the 100th edition, and most recently the 10th Anniversary edition each LBE has had a printed label adhered to it. The labels vary slightly in size but are around 100mm wide by 67mm high and have always been white. Most labels have rounded corners but occasionally squared corners have been used. The most sought after is the Harper Collins promotional LBE. 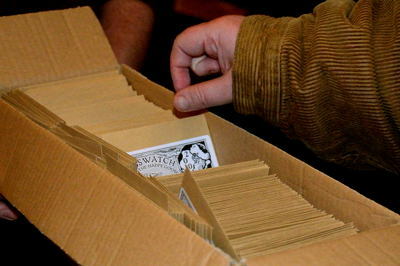 Sixteen envelopes were prepared and awarded to book stores in the USA as prizes for the best displays of Going Postal. It is rumoured that one contained the rare Blue Triangle sport. As well as the LBEs available to purchase many LBEs have been created for specific purposed such as the Regional meetings and Journal prizes. The envelope and contents were usually those of a stock LBE, but many could be exchanged for GCTS stamps.